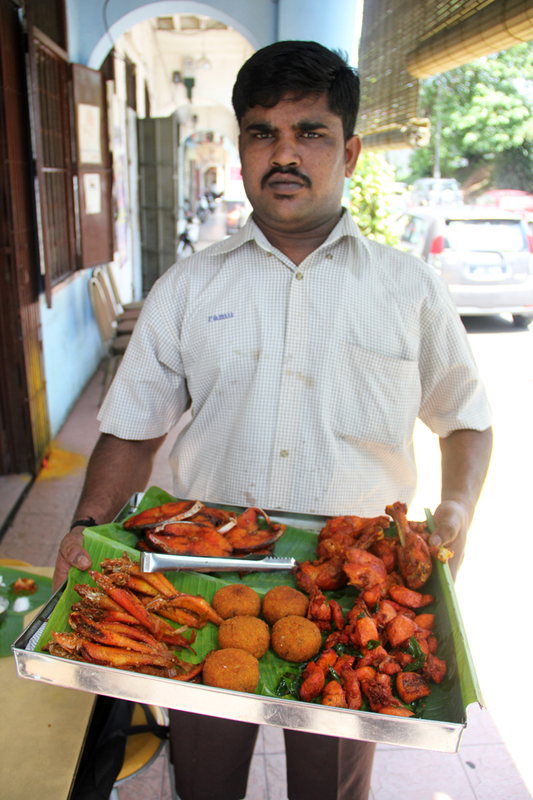 South Indian Food – Insanely Good! Have you ever eaten at a restaurant that was so insanely good you had to return the next day (or even later on in that same day), to eat there again? I sure have. Plenty of times. 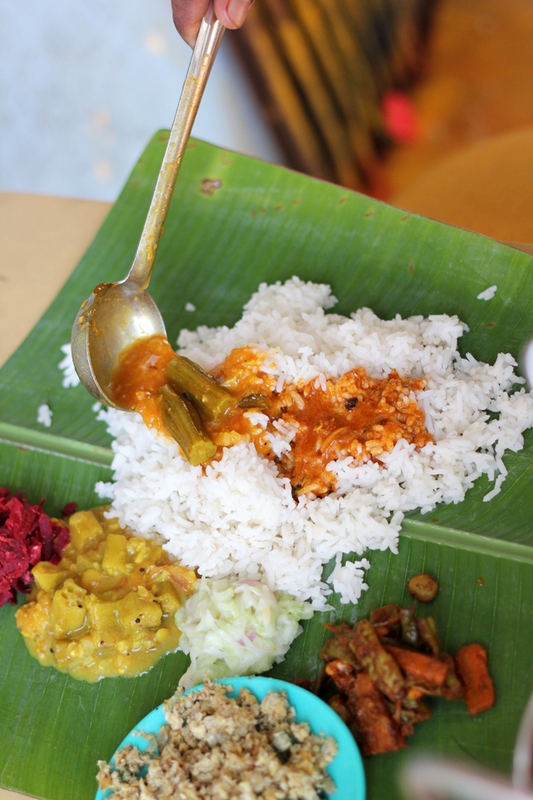 Recommended by both Mei and Austin, I headed off one day in search of Vishalatchi Food and Catering, purveyors of authentic Chettinad south Indian food in Kuala Lumpur. At Vishalatchi they take cuisine to the next level – their trio of chefs are all from Tamil Nadu and the magical array of spices used in the preparation of all dishes are also imported from southern India. As a lover of all things biryani, the first night I ordered the mutton biryani. It was served along with their normal assortment of vegetarian side curries. 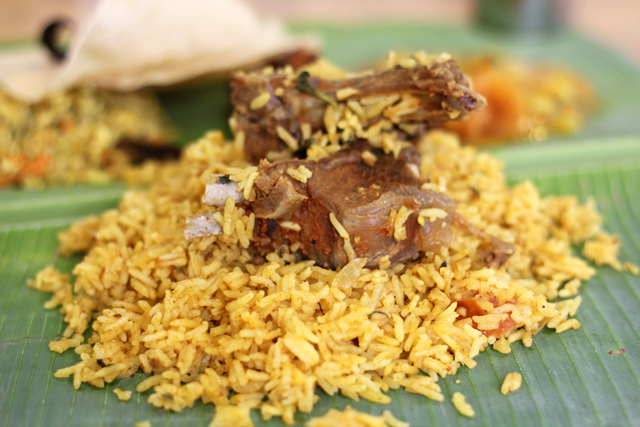 The rice was marvelously flavored, less sweet than a Thai style biryani, and the mutton slid off the bone with ease. I was overwhelmed by the amazing flavors. A dip in the vegetarian curry paired with the fragrant biryani rice and the tender mutton was so good, I had to simply close my eyes and savor it. After polishing off the biryani, I enjoyed a white rice re-fill, accompanied by more of the vegetarian curry mix until I was beyond satisfied. 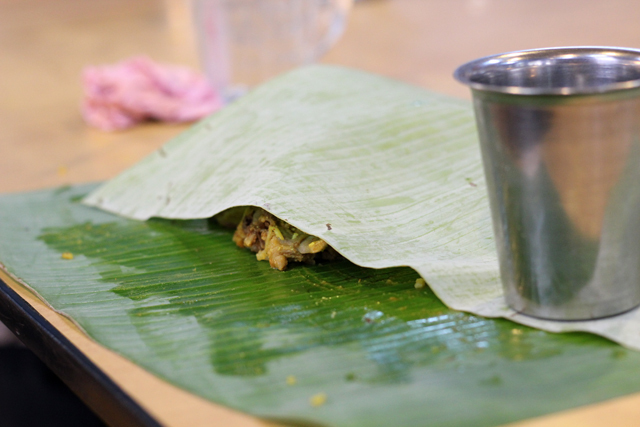 The customary practice is to fold over the banana leaf once you have the will to admit mealtime defeat. It’s a sad moment when you have to fold. 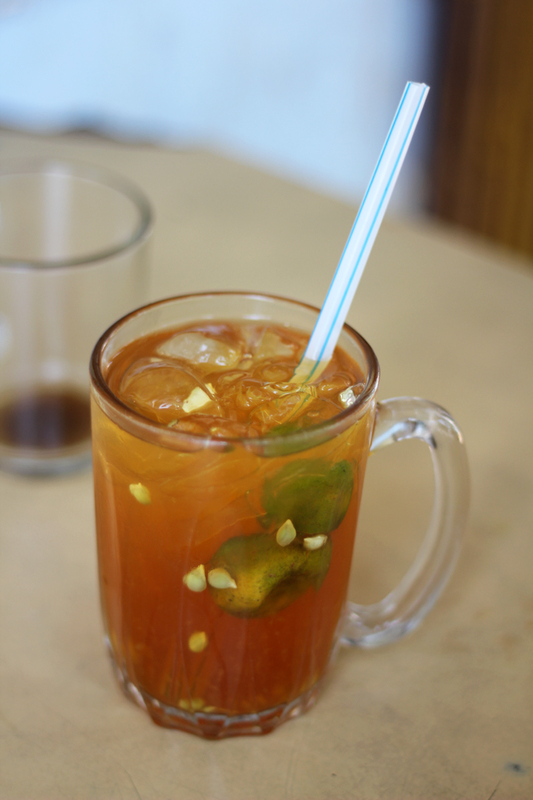 The food at Vishalatchi was so insanely good, I returned the next day for breakfast. Unfortunately when I arrived, they were still serving dosa for breakfast – not a bad thing but I wanted rice – so I waited until 11 am when the heavier dishes started rolling out of the kitchen. I nursed down a couple of lemon ice teas to cure my soaring excitement. Soon the glorious curries emerged, filling the restaurant with an aroma that could tame a beast. 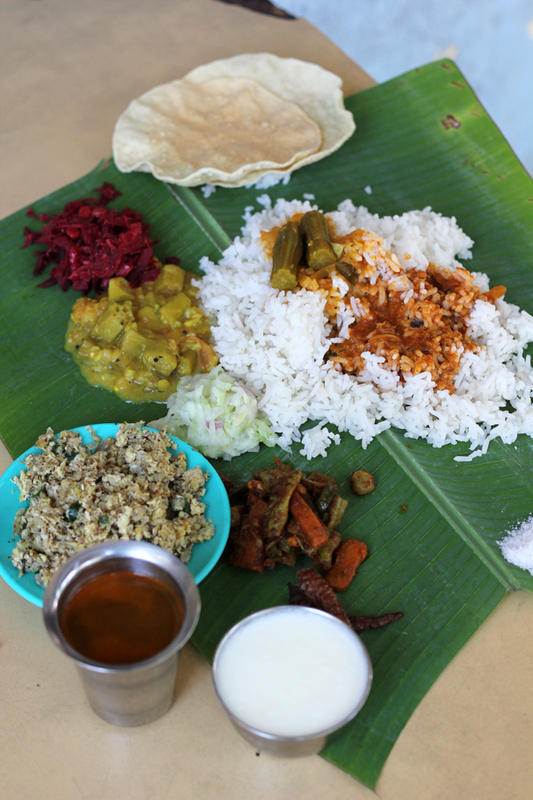 My banana leaf was placed in front of me and soon the veg dishes of the day were neatly piled in front of my mound of rice. Beat root curry, which I learned to love eating as Sri Lankan food, was among the selection that day. A few ladles of daal and a scoop of fish curry sauce added extra flavor to the rice. It was a challenge to order just a single non-vegetarian dish, but eventually I settled for the deboned spiced fish puttu. Again, it was remarkable, the chefs at Vishalatchi Food Catering can simply do no wrong. At first I was justing shooting photos of my food, but then I setup a tripod to take a video, and that’s when the staff curiously approached from their serving positions. 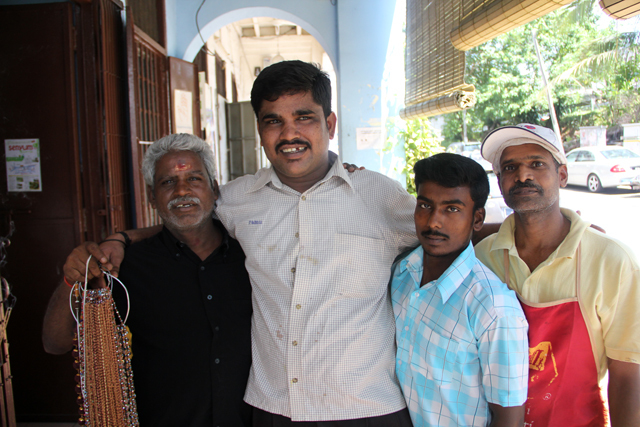 In a near idential Jaffna style Hotel Rolex experience, all of a sudden I was surrounded by the cheerful staff of the restaurant, all of them requesting a photo. They all got a pretty good kick out of this waiter that sat down in my seat and raised a pampadum! The head cook appeared from the kitchen for a portrait too. Even the thoroughly random necklace hawker (left side), who seemed to appear out of nowhere and pop in the photo, showed up. Plus he gave a nice little speech on the video too! When the commotion died down, the photos were taken, it was a banana leaf of ambrosia in front of me. I dug in with utmost enthusiasm. 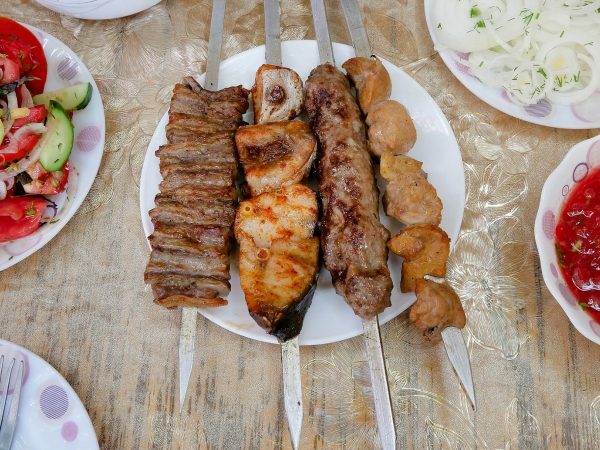 Eating with your fingers gives the opportunity to conjoin the variety of curries, yoghurt, and spices, into a perfectly balanced bite that overjoys your taste buds. He really was a nice guy! After devouring two overflowing South Indian food banana leaf helpings of rice and curry and fish, this man came bearing even more gifts. Despite his stern face, he’s the one that asked for the photo! Stuffed to a near slumber, I had to pass on the beautiful platter of glistening red meat. He, however, slipped me a little nugget of chicken, piping hot, and intensely tasty. 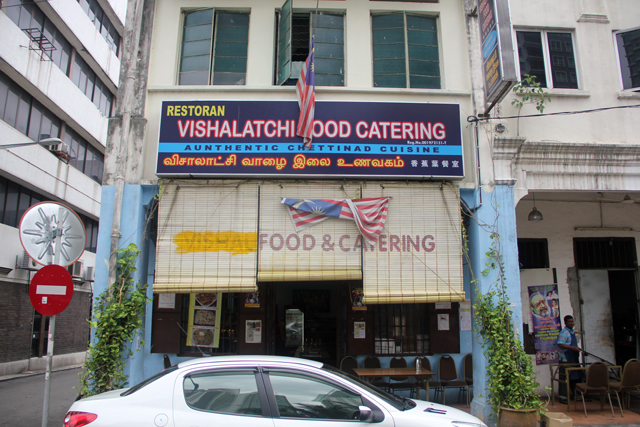 Visiting Kuala Lumpur and not eating at Vishalatchi would be a near tragedy. How to get there: From KL Sentral, walk down Jalan Tun Sambanthan 4 and make a left on Jalan Sultan Abdul Samad. Take that until it curves to the left but keep straight until you get to Jalan Scott where you make a left. Vishalatchi Food and Catering is on your left hand side. 38 comments. I'd love to hear from you! HELLO MARK, NEXT TIME WHEN YOU COME KUALA LUMPUR, MALAYSIA, CONT ME, I WILL BRING YOU TO TASTE PAKISTANI FOOD IN KUALA LUMPUR. 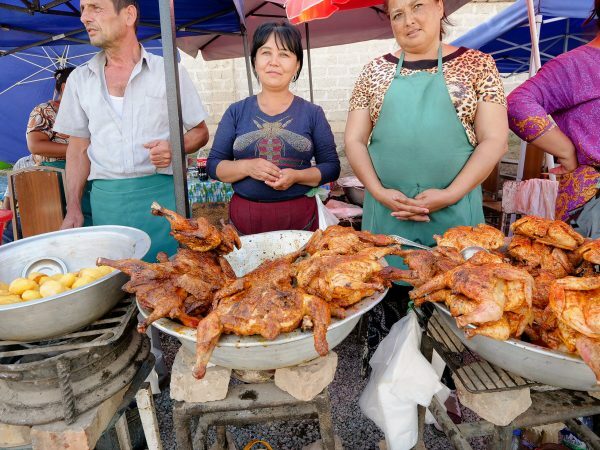 very interesting article and food. I’ve been watching your videos and reading your blogposts for a while now. In KL I finally had the chance to try one of your recommendations with two friends. The food was sooo good and they just kept bringing more and more! 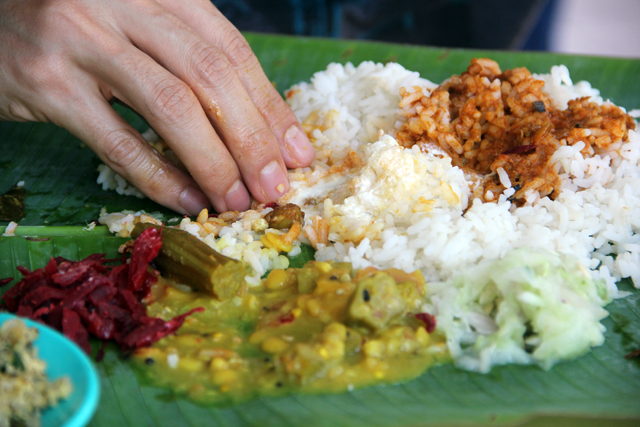 I ate with my hands for the first time (and loved it) and the chicken curry was just insane! Thanks for sharing all your food experiences! 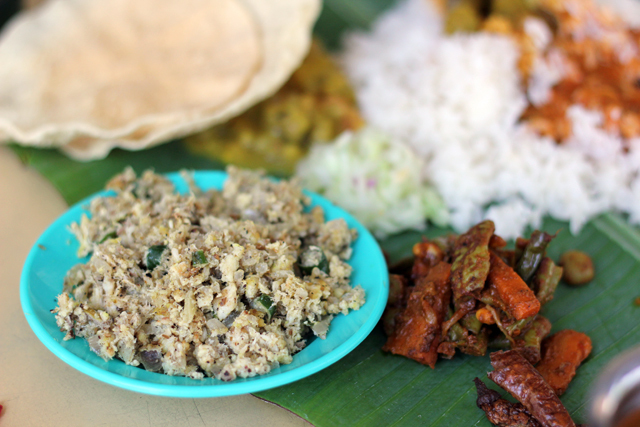 for South Indian food lovers, there are two restaurants in Bangsar, a suburb of KL. One is vegetarian, called Saravana Bhavan and a few doors away, there is a non-veg restaurant called Anjappar’s which serves authentic Chettinad food. I don’t think there are any other restaurants in KL that can beat these two for South Indian. Both restaurants are on Jalan Maarof. 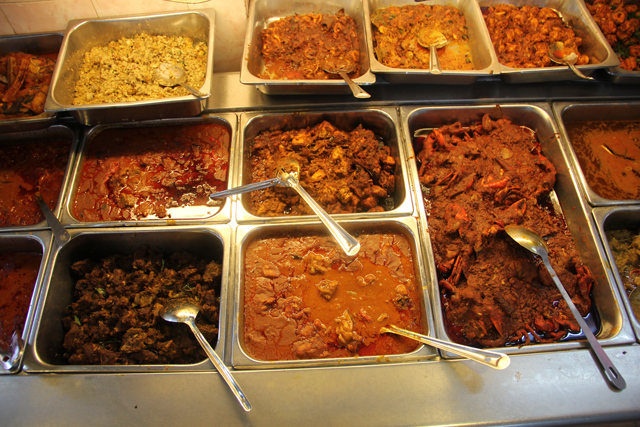 Both serve on banana leaf, and have a wide variety of dishes to choose from, and have great ambiance. 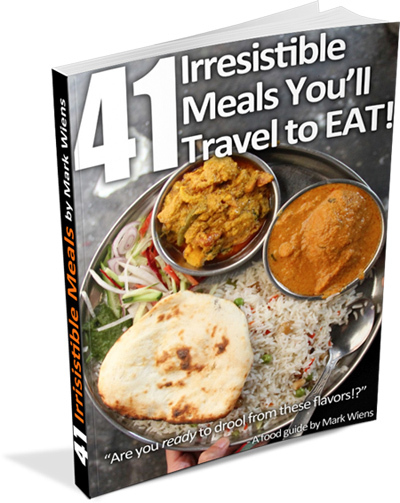 Dear Mark Weins I do agree with Ramu Ramiah because these two restaurants are most famous restaurants of south India and they have branches all over the world from U.S to Hong kong and I recommend you to have a try in these restaurants. We would like you to visit south India & try some amazing original south indian foods like Murugan Idly Kadai, Thalapkatti Biryani @ chennai, Hyderabdi Biryani & Haleem @ Hyderabad, Star Biryani @ Ambur, Chettinadu foods @ Karaikudi (Bangla), Ayera Fish Curry @ Madurai etc, etc. We went to this restaurant tonight. We had only arrived in KL a couple of hours earlier, after a very long flight from the UK, but this place was top of our list of places to try. Wow, it was so worth the visit. Really delicious food but also such a warm and friendly place. We got a bit of extra attention I think because we have good technique eating with our hands (years of experience in India and Sri Lanka) This resulted in a being brought little extra titbits for us to try. We had lassi to drink, also recommended. All in all, a brilliant experience and gets our trip off to a good start. Thanks so much for the tip off. One other point for others to note – they have changed the spelling of their name. It is now “Visalatchis” (dropped the h) I think there is probably a story behind that as I heard talk of rivalry between this place and Vishals just a few of doors down. Hey Priscilla, great to hear from you, and glad this place is still doing so well and the food is sill as delicious as before. Thanks for sharing about the name change. Have a great trip to Malaysia! This place has been on my radar ever since we planned our trip to KL. We’ve been there today and were not disappointed. Thanks a lot for recommending it, Mark! Hi Mark, Tried this it was amazing. Also your YouTube Channel rocks. Just got to Kuala Lumpur and went here for dinner tonight! Delicious! Thanks for the recommendation! Hey Vicky, glad you loved it! Great to hear that you like indian food. Generally, do a lot of americans like indian food? Am doing a food preference survey of different cultures, so any feedback is much appreciated. Hey Kalpana, good to hear from you. I really can’t speak for everyone, but just about all of my American friends, love Indian food. So it really depends, but I think lots of people from the big and diverse cities in the US like Indian food, maybe other from the countryside don’t like it as much. different countries. Keep up the good work. Thank you for checking it out Kalpana! Been following your blog for about 2 months now, was in KL in November and had me some Vishalatchi I also showed them your blog and how they were featured on there and ended up getting a free pan and a discount :). Also took your advice on Cambodia and had me some pork, rice and chicken stock I think for breakfast. Hey Rishab, wow, thank you so much for sharing. That is awesome that you went to Vishalatchi, I still have dreams about going there, and I sometimes want to jump on a plane just to eat there again. Glad you enjoyed it. Thanks for following along! I have been watching and loving your videos for a few months now. In June this year I flew to Singapore and took the train to KL (love those slow trains) and stopped in KL for two nights. Across the road from my hotel was all Indian restaurants and so the first night I went to one and had mutton curry which was amazing. So, of course, the second night I went back and had the same mutton curry along with a prawn curry which was to die for. Then I took the slow train to Penang for two nights but was a little disappointed with the food there. I didn’t venture far from the hotel though. Do you have any places of note on the island (around Georgetown if you have been there) as I am going to do the same trip in October. After Penang I took the overnight sleeper to Bangkok which is the best fun. Well, it is once you get to the Thai border as it’s completely full to overflowing until then. After that though you get the whole seat to yourself so you can stretch out and relax. The food was great too and the beer plentiful and cheap. The cheeky girl taking the orders convinced me to have a third beer. When I stop in KL again next trip I will certainly go to Vishalatchi. Hey John, thanks for sharing your adventure, and glad you love to eat as well. 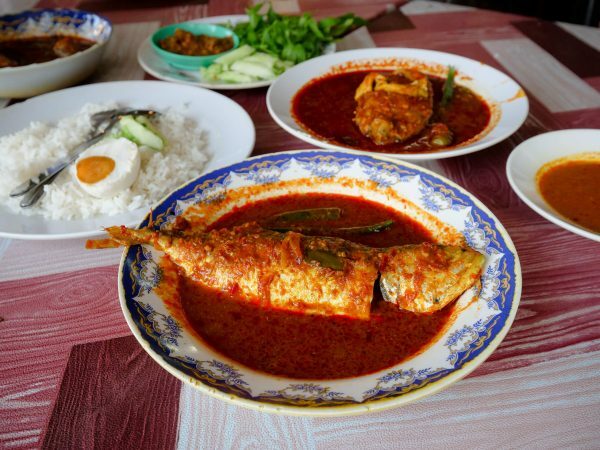 I actually haven’t spent much time in Penang or the island, I was there just a few days years ago so I don’t have any food recommendations. I’m hoping to go there for a food trip sometime in the future! Hope you continue to have an amazing trip! I’ve had exactly 10 non-vegan days since last February 1, when I first became 99% vegan. 9 of them for pho broth. I love pho and Pho 7 on Hampden in Denver CO is broth heaven run by the nicest Vietnamese family. However, for the mutton biryani described above I would dive headlong into shameless carnivore-for-a-day behavior. 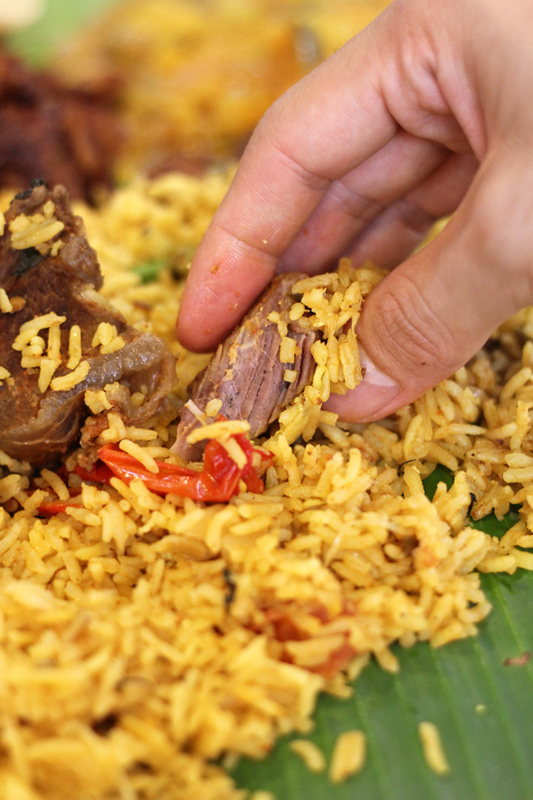 Is there anything as delectable as a super-tender, fall off the bone, meaty mutton (goat in actuality) biryani? Yes, and all the other competition for that title can be found as well, according to my palate, on the Indian subcontinent. Haha, thank you Colleen, great to hear the mutton biryani would be irresistible for you, it was for me too! I’ve just had south Indian the last two nights, it’s all over Riyadh. I don’t think I can get tired of it. I don’t yet have the hand eating concept completely down but that close-up Mutton Briyani photo up there helps. I’ve also been making progress from watching the Indian dudes do it naturally. I just need to get the fingers in there and stop worrying about how food infested they’re gonna become. There has to be a good reason why the people from the subcontinent eat this way. I think next time (very good chance tomorrow night), I’ll finally have it down. Hey Mike, that’s great you have so many South Indian restaurants in Riyadh – a wonderful cuisine to have everywhere! Yes, don’t worry about getting your hands dirty but try to use the tips of your fingers to smush a little bite together and then push it from your fingers into your mouth. I really think the feel of the food adds to the flavor! I just happen to read your comments and thought you might want to read this link.. I like the make-your-own style. Hey Stephanie, yes, it’s a great way of serving! 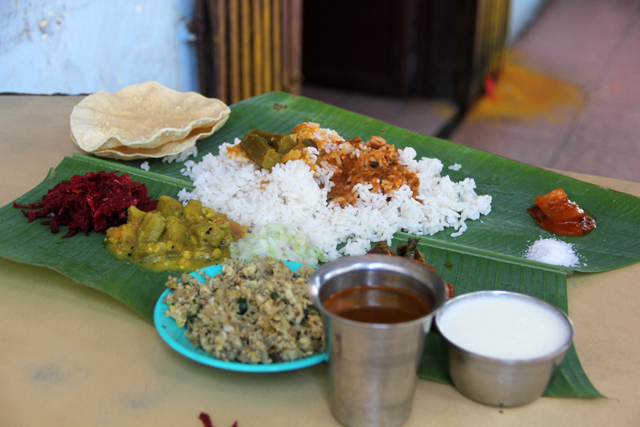 I love how the food is served on a banana leaf. It looks fantastic! Thanks Dean, it does add a nice touch to the meal.